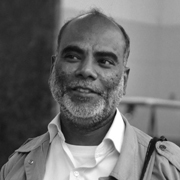 Sudharak Olwe has been a Mumbai-based photojournalist since 1988 and has worked as a press photographer with some of the leading newspapers in India. He is presently the Photo Editor of the country's largest read Marathi Newspaper, Lokmat. Sudharak has travelled the length and breadth of this nation and seen first hand some incredible stories of resilience, courage and change. He has worked in tandem with many NGOs presenting their extraordinary work with both rural and urban communities. In 2016, Sudharak was conferred the Padma Shri, India’s 4th Highest Civilian Award by the President of India. Sudharak's photography is that of empathy. It is a journey into the unseen perspective of the human condition. His photography cuts across all barriers and presents to you a moving story of individuals and communities. 2014 The book on Raj Bhavans of Maharashtra :Raj Bhavans of Maharashtra - Witness To Glory"
2006 Participated at an exhibition 'India in Colour and its vibrancy' for Indian photographers at the photography society of Japan as part of the festival on India in Japan. Was as one of the 23 photographers to participate in the 'Another Asia' Exhibition for photographers from South and South-East Asia at Noorderlicht festival at Fries museum, Leeuwarden, in Netherlands. 2004 Published first book "Spirited Souls: Winning Women of Mumbai" and was honored with the prestigious 'All Roads Photographers Award' from National Geographic Society. 2004 Chosen by Manfrotto as their brand ambassador for my work on Conservancy workers and exhibited and cataloged by them to create social awareness.